After ISIS-linked Paris attacks, Kerry visits London to work out US-led coalition's next steps; fighters recruited from West a prime issue. 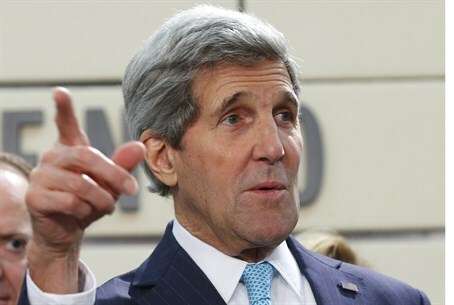 US Secretary of State John Kerry will travel to London on Thursday to host with his British counterpart a meeting of members of the coalition against the Islamic State (ISIS) terrorist group. Kerry's spokeswoman Jen Psaki said the one-day talks with foreign ministers from about 20 countries, including Arab states, would focus on "our shared efforts to degrade and defeat ISIL," an acronym by which the group is known. A British official separately confirmed the meeting will take place at Lancaster House in central London, two weeks after deadly attacks in Paris by three gunmen claiming to act on behalf of Al-Qaeda and ISIS, which has seized power in large swathes of Iraq and Syria. The meeting also comes after US President Barack Obama and British Prime Minister David Cameron met in Washington this week. Discussions will focus on five areas - foreign fighters, the military campaign against ISIS targets, its sources of finances, strategic communications and humanitarian assistance, the British official said. While in London, Kerry will hold bilateral talks with British Foreign Secretary Philip Hammond, Psaki said. He will then travel to the World Economic Forum (WEF) in Davos taking place Thursday through Saturday to meet with global leaders, as well as business and civil society representatives. The top US diplomat will deliver remarks at WEF's annual meeting on Friday.